Spontaneous Raman scattering is an extremely powerful tool for the remote detection and identification of various chemical materials. However, when those materials are contained within strongly scattering or turbid media, as is the case in many biological and security related systems, the sensitivity and range of Raman signal generation and detection is severely limited. 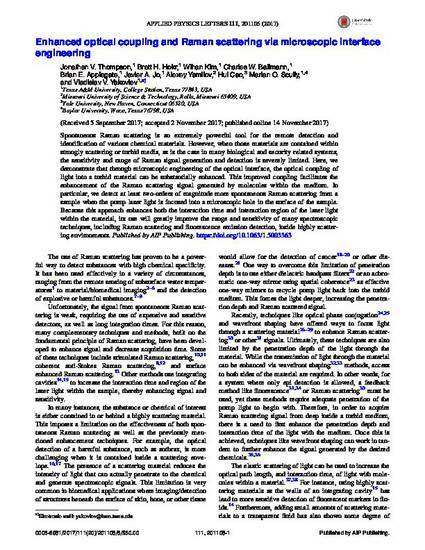 Here, we demonstrate that through microscopic engineering of the optical interface, the optical coupling of light into a turbid material can be substantially enhanced. This improved coupling facilitates the enhancement of the Raman scattering signal generated by molecules within the medium. In particular, we detect at least two-orders of magnitude more spontaneous Raman scattering from a sample when the pump laser light is focused into a microscopic hole in the surface of the sample. Because this approach enhances both the interaction time and interaction region of the laser light within the material, its use will greatly improve the range and sensitivity of many spectroscopic techniques, including Raman scattering and fluorescence emission detection, inside highly scattering environments. This research was supported in part by the National Science Foundation (CBET Award No. 1250363, DBI Award No. 1455671, ECCS Award No. 1509268, and ECCS Award No. 1509361), the Robert A. Welch Foundation (Grant No. A-1261), the Office of Naval Research (Grant Nos. N00014-16-1-3054 and N00014-13-1-0649), and the U.S. Department of Defense (Grant No. FA9550-15-1-0517). © 2017 American Institute of Physics (AIP), All rights reserved.